Rudolf and younger brother Adolf began their shoe business in their mother's laundry room in 1920. Their new, lightweight sports shoes began to attract attention and they moved into a location south of the Aurach river, near the train station of Herzogenarauch, in Germany. The Dassler Brothers Shoe Factory jumped onto the world stage in 1936 when they found themselves providing footwear for American Jessie Owens, who won four gold medals at the Berlin Olympics. But after the war, the fraternal relationship fell apart. One theory says that it could have had something to do with the Nazi party links and that Rudolf was picked up by American soldiers and accused of being a member of the SS, he was convinced that his brother had turned him in. Others speculate it could have had something to do with their wives, or a simple misunderstanding in a bomb shelter. No one really knows for sure. What is certain is that they felt they could no longer work together and in 1948 the Dassler Brothers Shoe Factory was split in two. Adolf, Adi for friends, created the Adidas Shoe Factory. 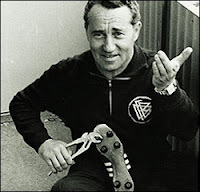 Adidas comes from Adi-Dassler. On the other hand, Rudolf decided to create the Puma Shoe Factory. Rudolph personally flew to Mexico in 1970, were the Football World Cup was taking place. Right before the Final between Brasil and Italy, Rudolph gave a new pair of Puma to Pelé, who was at that moment, the best player in the world. Rudolph asked Pele if he could call time to the referee right before this one was going to use his wistle to begin the game, hereby he would have time to stick his boots. And it happened like that, Pele tied his cords, and milions of viewers who were watching the final in front of a TV, saw his new boots. The action was done. Puma became a new sport shoe leader. The story of these two brothers is fascinating. I've heard that there's a lot of literature about them, about how they work, the different ways of promoting their products, etc. It always sounded very interesting to me. Just like your post.